I’m sure you’re all wondering what the day-to-day life of a scientist is on this ship. As I said before, there are several projects going on, with the focus being on assessing the walleye pollock population. In my last post I talked about the transducers we have on the ship that help us detect fish and other ocean life beneath the surface of the ocean. So what happens with all these fish we are detecting? The echogram that shows data from the transducers. The transducers are running constantly as the ship runs, and the information is received through the software on the computers we see in the acoustics lab. The officers running the ship, who are positioned on the bridge, also have access to this information. The scientists and officers are in constant communication, as the officers are responsible for driving the ship to specific locations along a pre-determined track. 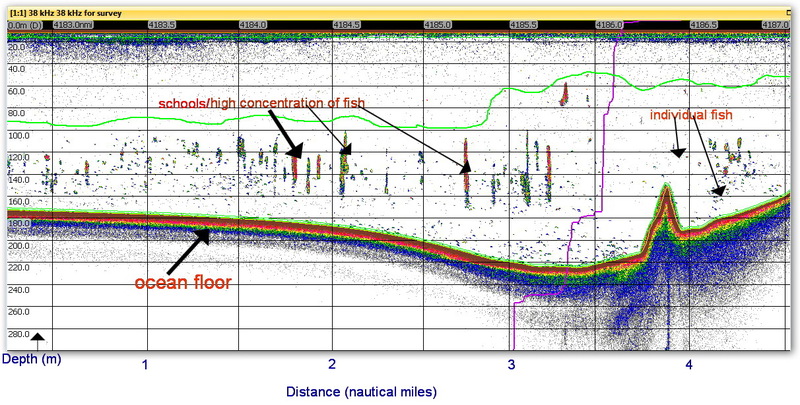 The echograms (type of graph) that are displayed on the computers show scientists where the bottom of the ocean floor is, and also show them where there are various concentrations of fish. This is a picture of pollock entering the net taken from the CamTrawl. When there is a significant concentration of pollock, or when the data show something unique, scientists might decide to “go fishing”. Here they collect a sample in order to see if what they are seeing on the echogram matches what comes up in the catch. 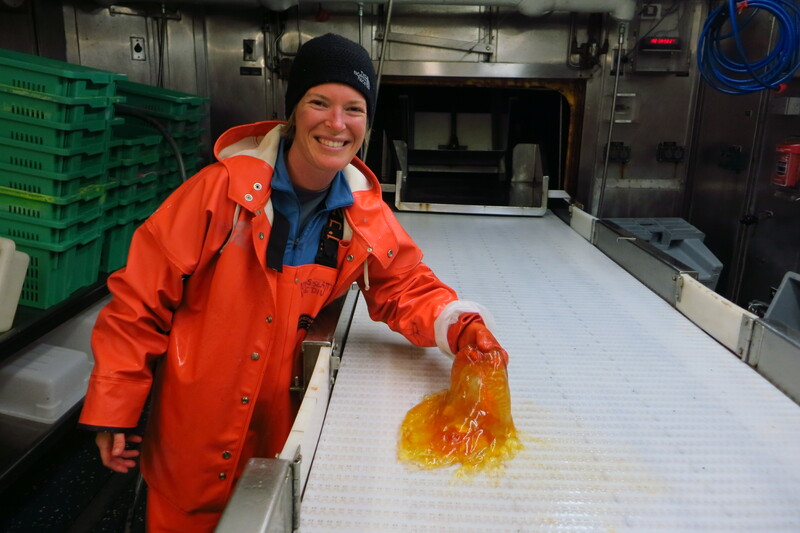 Typically we use the Aleutian wing trawl (AWT) to conduct a mid-water trawl. The AWT is 140 m long and can descend anywhere from 30-1,000 meters into the ocean. A net sounder is mounted at the top of the net opening. 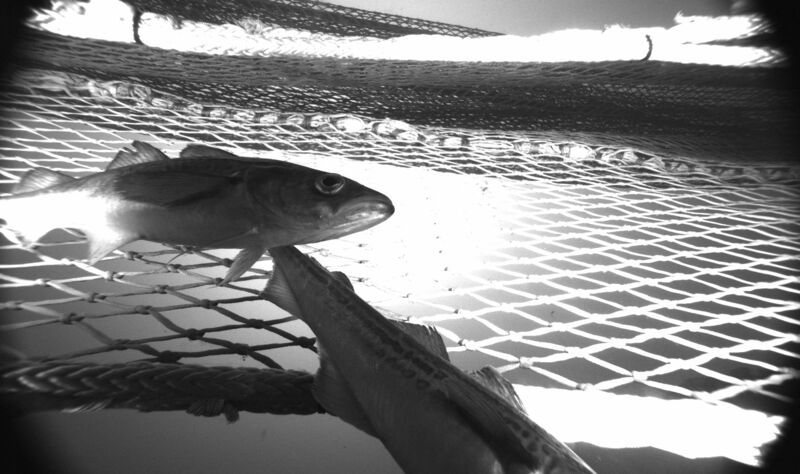 It transmits acoustic images of fish inside and outside of the net in real time and is displayed on a bridge computer to aide the fishing operation. At the entrance to the codend (at the end of the net) a CamTrawl takes images of what is entering the net. Once the AWT is deployed to the pre-determined depth, the scientists carefully monitor acoustic images to catch an appropriate sample. 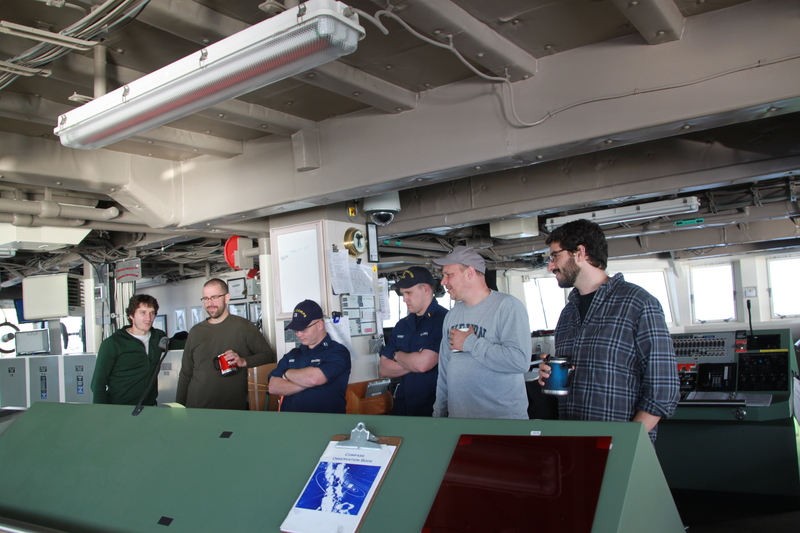 Deploying the net is quite a process, and requires careful communication between the bridge officers and the deck crew. It takes about an hour for the net to go from its home on deck to its desired depth, and sometimes longer if it is heading into deeper waters. They aim to collect roughly 500 fish in order to take a subsample of about 300 fish. Sometimes the trawl net will be down for less than 5 minutes, and other times it will be down longer. Scientists are very meticulous about monitoring the amount of fish that goes into the net because they do not want to take a larger sample than needed. Once they have determined they have the appropriate amount, the net is hauled back onto the back deck and lowered to a table that leads into the wet lab for processing. Here the scientists, LT Rhodes, and ENS Kaiser assess the catch. We begin by sorting through the catch and pulling out anything that is not pollock. We don’t typically have too much variety in our catches, as pollock is the main fish that we are after. We have, however, pulled in a few squid, isopods, cod, and several jellies. 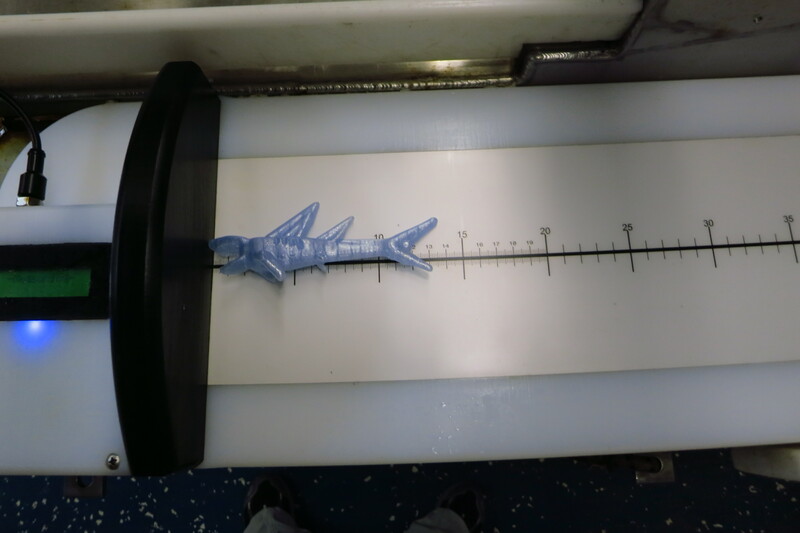 All of the pollock in the catch gets weighed, and then a sub-sample of the catch is processed further. A subsample of 30 pollock is taken to measure, weigh, collect otoliths from, and occasionally we will also take ovaries from the females. There are some scientists back in the lab in Seattle that are working on special projects related to pollock, and we also help these scientists in the lab collect their data. The rest of the sub-sample (roughly 300 pollock) is sexed and divided into a male (blokes) and female (sheilas) section of the table. From there, the males and females are measured for their length. The icthystick, the tool we use to measure the length of each fish, is pretty neat because it uses a magnet to send the length of the fish directly to the computer system we use to collect the data, CLAMS. CLAMS stands for Catch Logger for Acoustic Midwater Survey. In the CLAMS system, a histogram is made, and we post the graphs in the acoustics lab for review. The majority of our pollock so far have been year 3. Scientists know this based on the length of pollock in our catch. 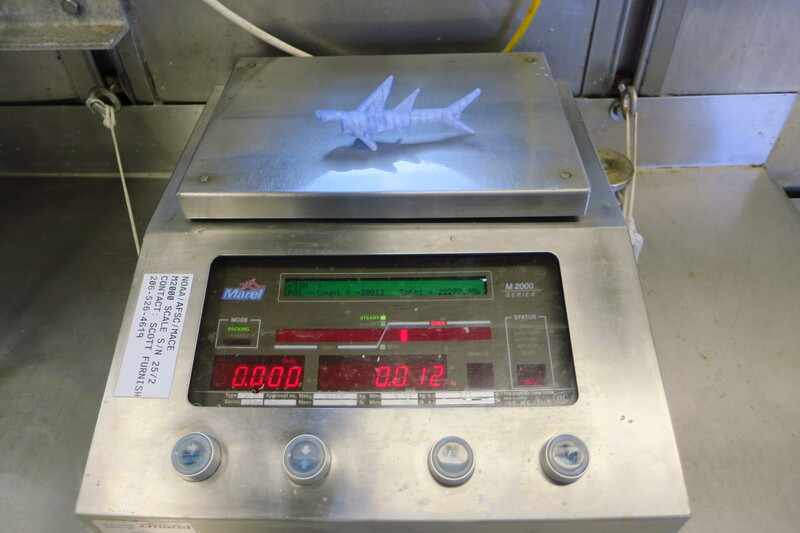 Once all of the fish have been processed, we have to make sure to clean up the lab too. This is a time I am definitely thankful we have foul weather gear, which consists of rubber boots, pants, jackets and gloves. Fish scales and guts can get everywhere! Here is one of many jellies that we caught. . I am finally adjusting to my nighttime shift schedule, which took a few days to get used to. Luckily, we do have a few hours of darkness (from about midnight until 6am), which makes it easier to fall asleep. My shift runs from 4pm-4am, and I usually head to bed not long after my shift is over, and get up around noontime to begin my day. It’s a little strange to be waking up so late in the day, and while it is clearly afternoon time when I emerge from my room, I still greet everyone with a good morning. The eating schedule has taken some getting used to- I find that I still want to have breakfast when I get up. Dinner is served at 5pm, but since I eat breakfast around 1 or 2pm, I typically make myself a plate and set it aside for later in the evening when I’m hungry again. I’ll admit it’s a little strange to be eating dinner at midnight. There is no shortage of food on board, and our stewards make sure there are plenty of snacks available around the clock. Salad and fruit are always options, as well as some less healthy but equally tasty snacks. It’s hard to resist some of the goodies we have! Luckily, we are equipped with some exercise equipment on board to battle those snacks, which is helpful as you can only walk so far around the ship. I’m a fan of the rowing machine, and you feel like you’re on the water when the boat is rocking heavily. We have some free weights, an exercise bike and even a punching bag. I typically work out during some of my free time, which keeps me from going too crazy when we’re sitting for long periods of time in the lab. Up on the bridge making the turn for our next transect. During the rest of my free time, you might find me hanging out in the lounge watching a movie (occasionally), but most of the time you’ll find me up on the bridge watching for whales or other sea life. The bridge is probably one of my favorite places on the ship, as it is equipped with windows all around, and binoculars for checking out the wildlife. When the weather is nice, it is a great place to sit outside and soak in a little vitamin D. I love the fact that even the crew members that have been on this ship for several years love seeing the wildlife, and never tire of looking out for whales. So far, we’ve seen orcas, humpbacks, fin whales, and Dall’s porpoises. Did you know? Otoliths, which are made of calcium carbonate, are unique to each species of fish. Where on the ship is Wilson? Wilson the ring tail camo shark is at it again! He has been exploring the ship even more and made his way here. Can you guess where he is now? 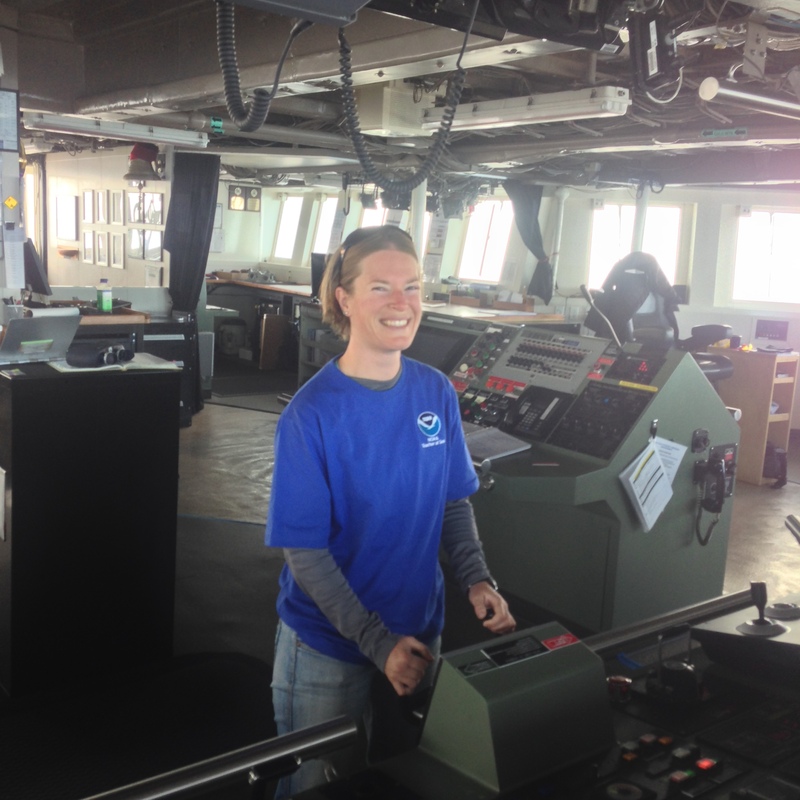 This entry was posted in 2015, Andrea Schmuttermair 2015, NOAA Fisheries Service, NOAA Teacher at Sea and tagged Aleutian Wing Trawl, AWT, clams, echogram, MACE, NOAA Ship Oscar Dyson, otolith, transducer, trawl, walleye pollock. Bookmark the permalink.